Countries across the world are struggling with the challenge to reduce CO2 emissions and the petroleum dependence of ground passenger transport. Since 1975 the U.S. has relied on fuel economy standards for newly sold cars and light trucks (called Corporate Average Fuel Efficiency (CAFE) standards) to reduce fuel consumption and, more recently, CO2 emissions from passenger cars. Under this program fuel efficiency initially increased strongly, but progress has been slower since the mid-1980s and especially since early 1990s for at least two reasons. First, for over two decades government regulation was not significantly updated to reflect improvements in vehicle technology. Second, the initial legislation failed to foresee that many Americans would use light trucks and SUVs as private vehicles for everyday trips—and thus lawmakers set lower fuel economy standards for heavy vehicles that today account for a large share of the U.S. passenger car fleet. Since the mid-2000s, in a renewed attempt to improve fuel efficiency and lower CO2 emissions, the U.S. federal government has again chosen the regulation of fuel economy/CO2 emissions standards for passenger vehicles over other policy tools. However, a comparison with Germany—a wealthy car-oriented country without government fuel efficiency regulations between 1990 and 2010—shows that government mandated technology standards for private vehicles may not be the best approach to significantly curb CO2 emissions and fuel use in urban transport. In 2010 CO2 emissions from ground passenger transport were greater in the U.S. than in Germany: 11.7 times for total CO2 emissions, 3.1 times per capita, 2.1 times per passenger kilometer, and 2.4 times per unit of gross domestic product (GDP). Additionally, between 1990 and 2010, Germany reduced CO2emissions from passenger transport at a faster rate than the USA—even controlling for population growth, economic activity, and travel demand. Both Germany and the U.S., have put in place several other programs to promote fuel efficiency, such as incentives for the purchase and registration of less polluting cars, cash-for-clunker programs during the recent economic crisis, or mandated the mixing of fuels with ethanol. However, these programs have only had a small impact on overall CO2 emissions and fuel use. Lower CO2 emissions and less gasoline consumption from ground passenger transport in Germany is explained by a more fuel efficient vehicle fleet (about 40-50 percent more fuel efficient), less driving (11,000km per person per year vs. 21,000) and a greater share of trips by foot, bicycle, and public transport (42 percent vs. 14 percent). Germany achieved greater efficiency of its passenger vehicle fleet (35 vs. 23 mpg or 7.5 vs. 11.2 l per 100km) without fuel efficiency standards, but with higher taxes on gasoline. In 2010, the cost of one liter of gasoline (95 Research Octane Number (RON) unleaded) was $1.75 in Germany compared to $0.74 in the USA. Most of the difference was due to gas taxes that were eight times higher in Germany than in the U.S. In 2010, taxes accounted for 62 percent of the retail price of gasoline in Germany compared to only 18 percent in the USA. The higher cost of driving shifts consumer demand towards more fuel efficient vehicles. The difference in gasoline retail price between Germany and the USA has been increasing over the last two decades due to Germany’s environmental tax reform that increased gasoline taxes annually by €0.03 per liter ($0.14 per gallon) between 1998 and 2003—totaling €0.15 per liter ($0.71 per gallon) over 5 years. 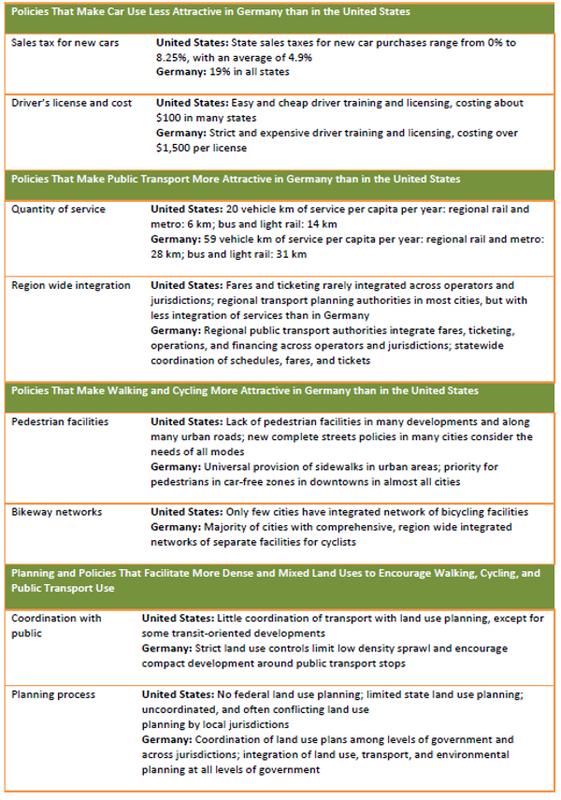 Less car use and more walking, cycling and public transport use in Germany can be explained by a package of many different policies that have the overall effect of promoting driving in the USA, but make car use less attractive in Germany and improve the appeal of walking, cycling, and public transport (see Table 1 below). Importantly, as the table shows, besides better and more attractive public transport, walking and cycling in Germany, most German cities have made driving less attractive. The analysis suggests that Germany achieved higher fuel economy of its vehicle fleet and greater reductions in CO2 emissions from transport than the USA without fuel economy or CO2 emission standards. This indicates that policies focusing on technological improvements can only be part of a policy package geared at reducing CO2 emissions from transport. Technological improvements alone are prone to the potential rebound effect of heavier vehicles, larger engines, and greater car travel demand. Germany’s experience shows that public policies can also help reduce car travel demand while making walking, cycling, and public transport more attractive modes of transport. This article is based on the paper, ‘Daily Travel and Carbon Dioxide Emissions from Passenger Transport Comparison of Germany and the United States’ in the Transportation Research Record: Journal of the Transportation Research Board.